In his early novels, Ian Fleming gave James Bond a very small .25 caliber Beretta pistol, even though an experienced spook like Fleming should have known better. Then, a friend of his who happened to be an arms expert pointed out to him that Bond's Beretta, as a self-defense and assassination weapon, was like taking a band-aid to a sucking chest wound festival. He recommended that Bond carry a Walther PPK instead. Reliable, easily concealable, not inconsiderable punching power, all of that. The Beretta 950 is a semi-automatic pistol designed and manufactured by Beretta since 1952. Bond beloved Beretta is replaced with a Walther PPK in Dr. No. Soviet Russian Major-General who served as the chief executioner of the Stalinist NKVD under the administrations of Genrikh Yagoda, Nikolai Yezhov, and Lavrentiy Beria. Upon hearing this, Fleming British-freaked out (raised an eyebrow, to the rest of us). He then wrote into his next Bond novel a holster malfunction that prompted his bosses, in the novel Dr. No, to ceremoniously replace his beloved Beretta with a Smith & Wesson Centennial revolver and a Walther PPK that was chambered in 7.65 mm, no less. The S&W revolver didn't last long. The PPK stuck. Now, the Walther PPK has been around a long time and is still one hell of a weapon today. It's not as beautiful as a Luger because nothing will ever match the sheer form-follows-function... well, you get my drift. But the Walther is a much-imitated standard in reliability. After all, it's a German pistol. You might agree with me that it would be ill-advised for a British assassin to use an old Webley in plying his trade, because that UK-made weapon would act as calling card. The same could be said of an American and, say, a Colt Frontier .45, or a Soviet with a Nagant. That's why using a foreign gun provides an assassin with “plausible deniability”. This is one of the reasons that prompted Vasili Mikhailovich Blokhin, a Russian soldier who allegedly found his vocation in life as an executioner-in-chief for Stalin, to make the Walther his weapon of choice. He also put the PPK through an extreme field test of reliability. 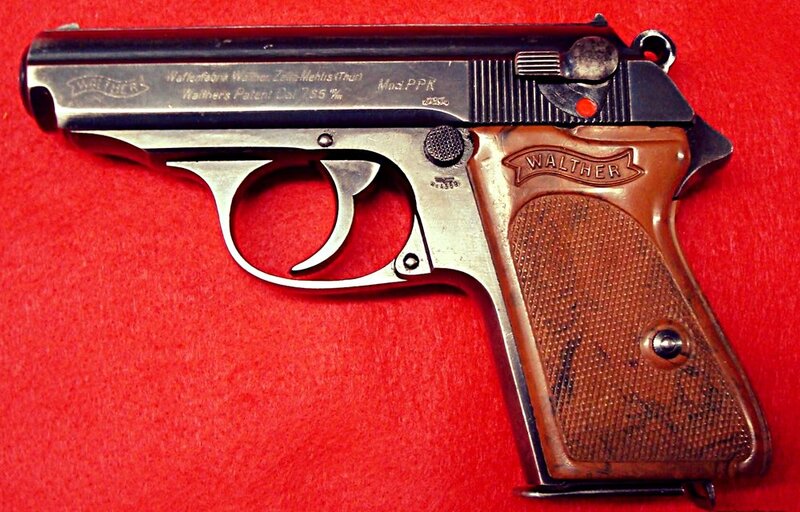 Boothroyd suggested in passing that Bond should carry the German made 7.65 mm Walther PPK Police Pistol as his chosen sidearm. Vasili Mikhailovich Blokhin joined the Cheka in 1921 and naturally gravitated towards what they called chernaya rabota, i.e. Black Work. It turned out that he excelled in Wet Jobs, assassinations, executions, etc. He was such a master in the art of nastiness that he caught Stalin's eye, no slouch at nastiness himself, who appointed him the NKVD Commandant of the prison inside the Lubyanka. This was a licence to kill. And boy, did he kill! Once, drinking in some East-end dive, this writer was told by a man on a bender who kept a gun in his belt, that he did what he did to provide for his wife and kids. I wisely refrained from asking exactly what it was that he did, or show any disbelief. Instinct told me that this one was a genuine bad guy. My knowledge of human nature told me that he probably really did believe in his own legend most of the time. But sometimes the sheen wore off, and this was the reason why he was now drunkenly talking about his life to me; a confession of sorts made to a perfect stranger. This being said, my personal, most generous opinion of Vasili Mikhailovich is that he might have been in this same twisted class of people for whom ideology or religion affords the moral fortitude to perform unspeakable deeds. Ideology or religion or alcohol. A telling detail : he provided vodka every night after "work" to all his associates. The number of people he personally, one could almost say intimately, turned into corpses in so staggering it becomes abstract. Blokhin and his trusty Walthers (plural: he actually wore them out) were recorded as killing tens of thousands of people throughout his career, using his preferred method of execution: a bullet to the base of the skull. This officially makes him the all-time champion of executioners. He was also personally tasked with every high profile execution and, in the course of the purges, even that of a couple of his own bosses. He did not trust the standard Russian TT-30 pistol. He also refused to use the Russian Nagant because, apart from plausible deniability considerations, he found the powerful revolver's recoil painful after a dozen executions. Drawing a portrait of his activities during the infamous Katyn massacre would make any Hollywood horror movie look tame by comparison. Think of the Hostel series of films. In the basement of the local NKVD headquarters, a rather sinister place to start with, he designed a suite of rooms especially built for killing people, resembling in principle a short assembly line. Blokhin tried his best to be a paragon of efficiency incarnate. Stalin's objective was to literally behead Poland by rubbing out its aristocracy and intelligentsia; may it be scientific, military or intellectual. Blokhin's objective was 300 kills a night. Every night. From dusk 'till dawn. Prisoners were led inside a small vestibule with red painted walls called the Lenin Room where their identities were verified and recorded. Then they were taken through a door into the inner sanctum, a room with a slanted floor which allowed the spilt blood and brain matter to be hosed down a drain. There Vasili Mikhailovich awaited. The prisoners were forcibly pushed against a log wall and Blokhin, his uniform protected from blood spatters and brains by a rubber apron and rubber gloves that came up to his shoulders, dispensed death to his prey with a bullet to the back of the head from one of his trusty Walthers. As the victim hit the floor of the soundproofed room a door opened and assistants came in to drag the corpse out and hose down the killing floor, all while the next victim's credentials were being checked in the Red Room. The assistants loaded the bodies onto a truck. Every night, under cover of darkness, two trucks full of cadavers were dumped somewhere out in the countryside, where a bulldozer operated by an NKVD insider made the bodies disappear into the ground, Auschwitz-like. Seven thousand of Poland's best and brightest were disposed of in that way, the result of a 28 day killfest. Later, in those very same fields, children began to collect brass uniform buttons that eventually migrated up to ground level. You know, bogus moral fortitude can carry you only so far. After the war, Blokhin was awarded the Order of the Red Banner and the Order of the Badge of Horror – Honor, I mean – and a small pension for his services. He was then stripped of all that as the old CCCP began to morph into the Russia that we all know and are still learning to love today. Maybe. Blokhin used briefcases full of Walthers to perform countless atrocities. But it also happens to be the gun that Hitler used to blow his own brains out.